I'm talking birth dates here. 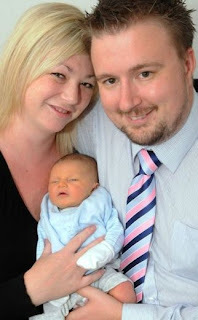 Stefanie Thomas, a support worker for the Devon and Cornwall Police had a baby on the 6th of September. The birth was pretty much standard: twinges on Sunday, several false starts and then Baby Oliver arrived on the Tuesday - which just happened to also be Stefanie's birthday. Oh, and also her husband Paul's birthday too. Paul said, "It's quite convenient because I now only have to remember one date for all of us. We never imagined it could happen but as the days approached it seemed more and more likely." But with odds of 133,225 of this happening the couple wish they'd gone to the bookies and placed a bet. But no matter, Oliver is priceless! I've heard of this happening with two people in a family - but all three??? That's impressive. Like Trish I have heard of two in a family but all three is amazing. Yea but its bound to happen somewhere, like anything can happen amongst millions and millions of people.